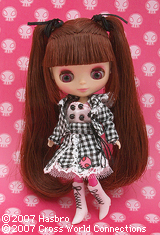 This feisty Petite Blythe is just as cute as her Neo Blythe sister! This pair can go everywhere together! She might be small, but she is the cutest and sweetest Petite to be Neo Ultimate Tour's sidekick. The intricate design of the Neo's dress is re-created for the Petite. The make up is slightly pinker than Neo but the color brings out hercheerful character. She is wearing matching pink tights. The body type is Tip Toe,The package is also created based on the same concept as the Neo. The Petite comes with a small carrying case. Neo Blythe is off to the journey carrying Petite inside the case. Enjoy the journey with the coolest new Neo and Petite Blythe Ultimate Tour! Doll (Tip-Toe), jacket, skirt, camisole, hair accessories, shoes,carrying case, and stand.